I’ve always done some form of exercise. Even more than 50 lbs ago last year, I used to get up and workout. But the saying “weight loss is 80% fork, 20% work” is certainly true for me. I was getting fatter and fatter even though I was working out. That being said, I knew that I was still doing something good for myself when I did work out. My mental and emotional health benefited. Exercise lifted my mood and cleaned the cobwebs out of my brain. I then changed my diet and went keto. The keto diet changed my life. The weight started coming off. And do you know what else happened? I actually wanted to exercise more. I was able to increase the intensity, frequency and consistency of my workouts. I know that exercise is an absolutely important part of any journey to wellness and living our best life ever. I still have to make that decision every night to get up before dawn the next day. I still have to push myself every workout. Here are my tips for people for whom making exercise a habit doesn’t come easy. Like me. What kind of exercise do I enjoy doing? How often will I realistically work out? Am I gym person or an outdoorsy person or a solitary person? Do I do better when someone is pushing me or am I able to push myself? Do I work out in the morning or in the evening? How will I prevent myself from getting bored? I know that complex dance type aerobics are not my thing. I also know that a whole heap of jumping up and down ain’t gonna work for me. I love walking outdoors and I like resistance training and workouts that challenge my strength. I started out with a modest goal of 3 days per week, 30 minutes per day. I knew this would help my overall objectives, and I felt that I could realistically commit to that. I like certain aspects of a gym environment: I LOVE spinning and I LOVE the weights room. But the gym that I was comfortable at, that offered spinning and weights, closed down and I couldn’t settle on another one. I am a solitary person. I like exercising alone. I solve all the problems of the world as I am working out 🙂 and I enjoy the time alone, pushing myself, with not distractions, no interruptions. I hate being shouted at or pushed. There is no gym instructor in heaven or on earth that can push me harder than I can push myself. That being said, a good gym instructor is critical in getting you aware of good form and intensity needed to achieve goals and prevent injury. But I’ve been going to gyms all my life. I know a thing or two by now. If you’re new, going to a gym to start may be worth considering. I’m a morning person, so getting up 45 min earlier works perfectly for me. I just go to bed earlier, and happily so. Don’t get hung up on the time of day you work out. Working out any at all is better than not working out. Work with your natural inclinations to give yourself a better chance of being consistent. 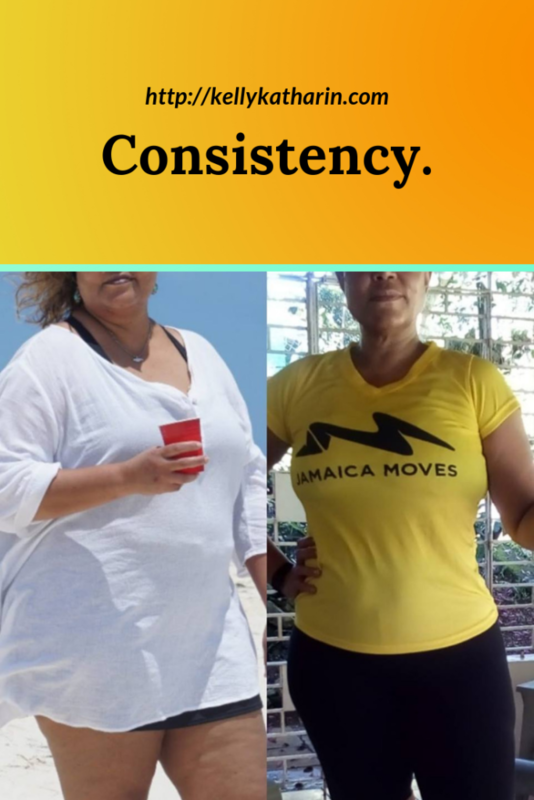 Consistency is what will deliver the results. An intense workout every now and then certainly will not. Don’t kid yourself. And if you’re like me, not naturally inclined to work out, boredom will get the better of you before you say “who dat” and in short order you’ll find yourself reneging on your desire and commitment to exercise. Variety in my workouts was critical to my staying the course. Be Ready I set out my workout clothes from the night before. When I used to go to a gym, I’d pack my gym bag every night and put it in my car. Gym or Home ? These days I work out at home. It’s easy logistically, it’s private, it’s solitary and I can do it at any time. Before the crack of dawn is what works for me. How often? I started out with a 3 days per week schedule. As I lost weight, I felt incentivized to up my frequency first of all. I added Saturday mornings, then I added another week-day. My schedule these days looks like this: Monday, Tuesday, Wednesday, Thursday and Saturday. 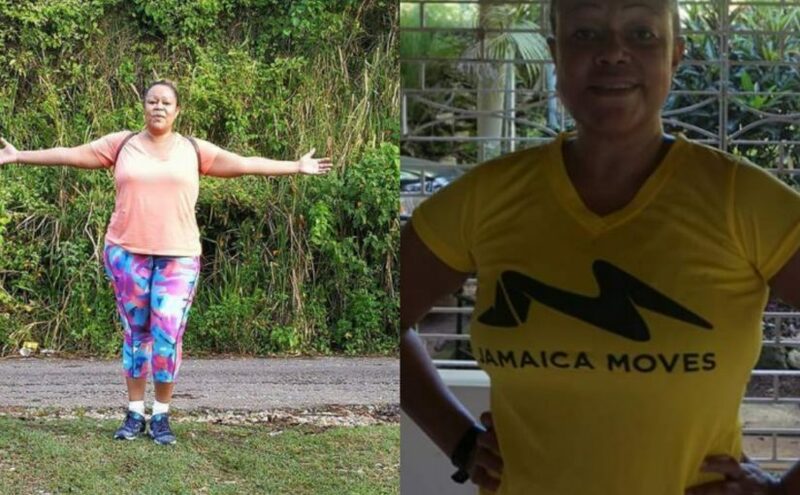 What I did : I started out using a variety of exercise DVDs that had yoga, resistance training with dumbbells, kick-boxing and low impact cardio and body weight exercises. I focused on getting at least 30 minutes in each session and no more than 40 minutes. Why? I know myself. I will find any reason to talk myself out of a workout that’s any longer. Consistency is what I was after. I had to find that sweet-spot between being challenged and dropping my hands. As I lost weight, in addition to increasing the frequency of my workouts, I also felt incentivized to increase their intensity! So I took on harder workouts and used heavier dumbbells. I started running in addition to walking on Saturday mornings, and I have made one of my week-day workouts a straight cardio and body weight type of thing. Whew. Wednesday used to be dedicated to just stretching. It still is, but in the form of more challenging yoga workouts that do more for me than just stretching. And I do high intensity interval training (HIIT) with dumbbells that give a bit of cardio but also the all important resistance component so critical for those of us over 40. 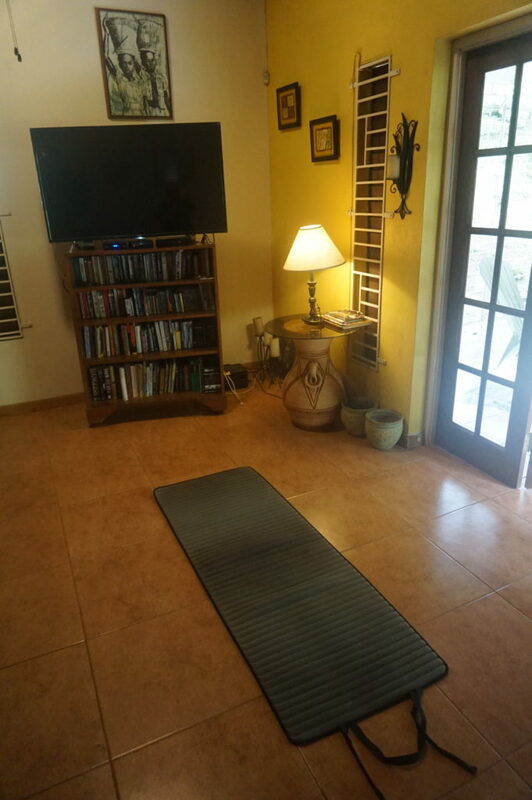 The beauty about exercising at home is the ease of getting started! You don’t need fancy new gym wear. You don’t need to budget travel time in to your workout time. It’s private. And it’s free. I mentioned that I had a variety of DVDs. And those work. Believe me they do. Then I discovered the wealth of (100% free!) resources on YouTube. Hallelujah! I’m going to list my current favourite ones here and briefly describe what you can expect. I simply log on, select my work out and hit play. It is perfect for someone like me who is bored very easily by exercise. I need new, I need different and I need challenging. HASFit Tribe: A husband and wife duo who offer a range of workouts to suit specific needs. I zero in on their HIIT and tabata style workouts that last anywhere from 30-40 minutes. They’re great. Fitness Blender: Another couple who also offer a range of workouts to suit specific needs. I mostly use them for their cardio workouts. These are typically between 35-45 minutes. Yoga with Adrienne: I keep coming back to Adrienne. She provides the most effective and doable yet challenging work outs that range anywhere from 15 minutes to an hour. I go for the 30-40 minute range. She’s informal and natural. PopSugar Fitness: Again, a wealth of options including HIIT, cardio, dance, kick boxing and yoga. Very high energy instructors, sometimes a bit too “out there” for my liking (remember I don’t need a cheerleader. Just show me what to do, and I’ll try my best) but I’ve found some great yoga and low impact cardio workouts with them. Leslie Sansone: She’s queen of the walking workout videos. I used her DVD for years and haven’t actually used her You Tube resources. But I include it here because walking is really such a great way to start to build an exercise habit. If you can walk for 30 min outdoors a couple times a week, you’ll see and feel the difference. If that is challenging in terms of logistics, etc., you can still walk right in front of your TV or computer. You get what you give! So even though you may feel foolish stepping on the spot in front of that screen, you can raise your legs and swing those arms higher. You’ll work up a sweat and get your heart rate up. General Tips for getting the most out of your workout: Fitbit, Bra and Shoes. My Fitbit has been awesome as I’ve upped frequency and intensity. I’m able to assess the efficacy of my various workouts and this helps me to make better choices going forward. A good sports bra has been invaluable on my weekly runs and for the cardio routines. Trust me, nothing will hold you back like a bouncing bosom! And a good pair of trainers is critical for preserving joint health and enabling a good, powerful and safe run or workout. Some people use various apps that help keep them accountable. So what’s holding you back? If you’re looking to start why don’t you try what I did at first? Three days a week with walking and yoga for beginners workouts is a great way to get going. You’ll feel the difference, and it’s non-threatening and not at all complex so you’ll be able to build a workout habit as you remain consistent. As you get stronger and your new habit takes root, you’ll naturally want to increase the frequency and intensity of your workouts as I did, and you’ll do it! If you are someone who works out at home like me, I’d love to hear your favourite go-to resources for getting it done. I’m always on the lookout for new and effective. Please subscribe to my blog to get your free copy of specially selected recipes that helped me transition to a low-carb way of eating. The keto diet really really has been working for me. My exercise routine is the perfect complement to this way of eating. 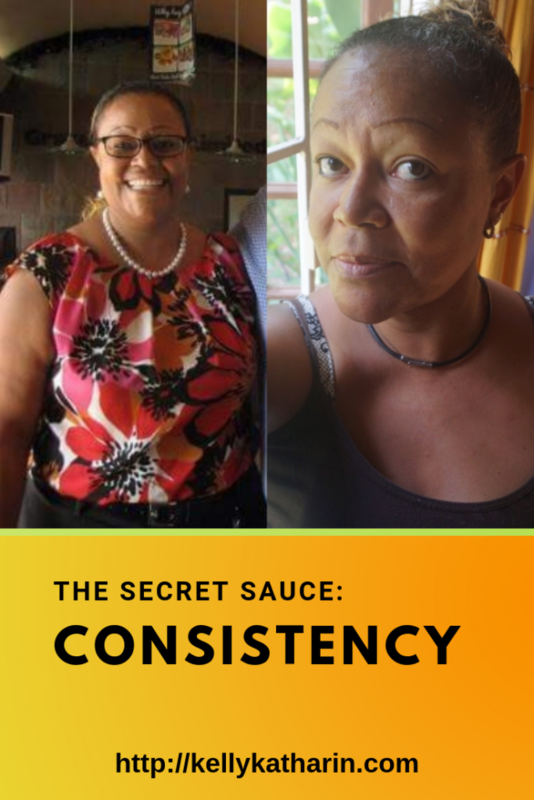 Consistency: the key to making exercise work for you! Excellent post! It’s SO easy to talk yourself out of working out. Whether you ‘don’t have time’ or just ‘don’t want to’. Carving out 20-30 minutes a few times a week has been a great start for me. Thanks for the YouTube suggestions! Thanks again, Kelly! Practical things like the sports bra and trainers are simple but so important. Amazing the impact they have on ones exercise time. Yes!!! 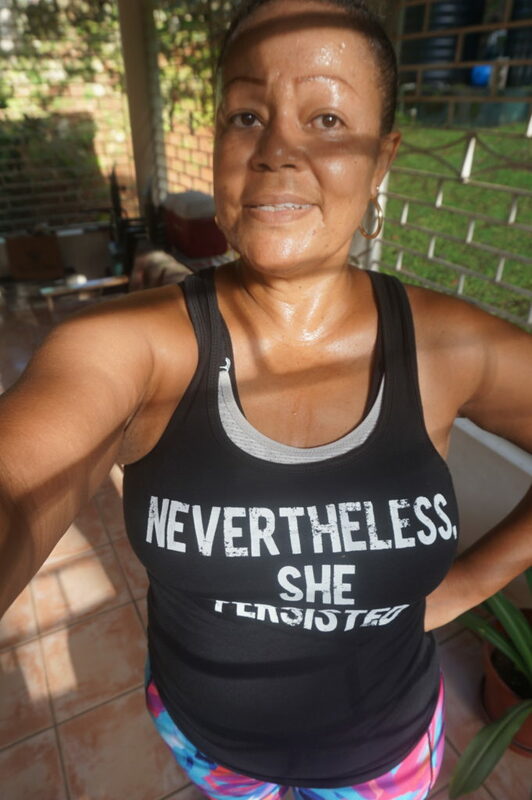 I can’t run or do high impact cardio without a sports bra on. LOL!!! Good shoes are worth the investment too especially if you’re running. I get that. I also prefer to workout alone. I end up at thegym most often, even though I have the resources needed to exercise at home. I also use Fitness Blender on the rare occasions I exercise at home. When I am in Jamaica, I do Pilates 3 days per week. I try to get there early enough to do some cardio first. The instructor incorporates weights with dumbbells. Then on Sunday I di a bit of cardio and yoga and sometimes tai chi. I do more weightlifting in Grenada. Going to take up swimming per the physio’s instructions. Previous Previous post: Could the keto diet be the answer to PCOS?